Platooners Slot is a Elk Studios powered 5 reel and 178 paylines video slot. 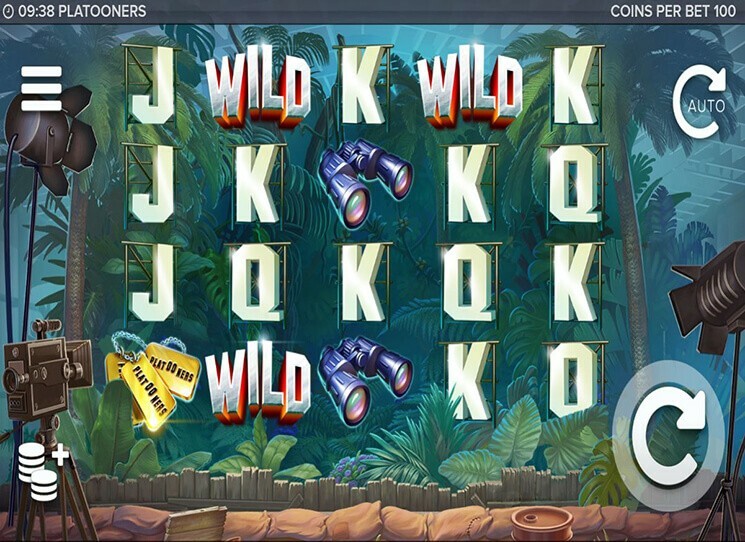 As the name suggests, video slot theme is inspired by the marine corps. Platooners Slot takes place in the Jungle, where 3 soldiers try to fight the enemy – Snakes of Fortune. Visually slot is very pleasing and cartoony, with high quality graphics. Low value symbols are standart playing cards symbols (10’s, J’s, Q’s, K’s and A’s). High value symbols are various army and jungle related items such as – binoculars, knives, medical bags, dog plates and totem mask. In addition, there is also a Wild and Scatter symbols as well. Before investing real money players can try Platooners Slot for free, or visit any Elk Gaming casino such as: Mr.Bet Casino, SlotsMillion Casino, BetChain Casino and others to play with real money and win. Return to player rate is currently 96.3%. Before you join the fight against the enemy, wager need to be placed. In lower left corner is a “Coins Stack” button which gives you option to regulate bet amount it ranges from 0.20 to 100. In the upper left corner is a “Settings” button where you can see what kind of bonus games there are, also adjust music and small visual settings. “Autoplay” button is in the upper right corner, by using that button you can set number of spins that will go without interruption. “Spin” button is in the lower right corner. Rockets Platooner feature – one of the Platooners will launch a rocket, which will cover 1st and 3rd reels. All the symbols in the selected reels will replaced with the same symbol. Grenades Platooner feature – random generated Wilds will appear on the 3rd, 4th and 5th reels, after red Platooner throw some grenades. Bullets Platooner feature – you will get a guaranteed winning combination. Main feature that game offers is called Platooners vs Snakes of Fortune. When 3 or Scatter symbols land anywhere on the reels you will activate the feature. You will start the feature with 15 Free Spins and Platooners will start attacking Snakes of Fortune. How many soldiers attacking Snakes, depends on the number of Bonus symbols you land to activate the feature.